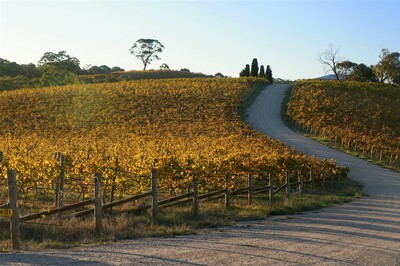 David Bray has reviewed the 2011 JOSEPH d'Elena Pinot Grigio in the September 2011 issue of QHA Review. JOSEPH d'Elena Grigio is Joe Grilli's tribute to his daughter; grapes planted in the same week she was born in 1998, now producing a lovely savoury style with minerality and elegance. Renowned UK wine critic and star of Oz and James wine adventures has reviewed the following wines in his newly released 2012 Best 250 wines book. "This is one of Australia's Most remarkable white wines. Born in the unheralded dusty plains north of Adelaide from a patch of the decidedly untrendy colombard grapes, it seems to change and get better with every vintage and throws up endless arrays of unlikely flavour variations. This year it somehow mixes the passionfruit's thrillingly sharp yet scented personality with the crispness of a green apple and the crunchiness of cos lettuce. But it's not finished. The texture is as the glistening blade of a rapier, yet there's some savoury warmth like polished leather and a nip of persimmon bitterness. Where did all that come from? It'll be different next vintage. Remarkable wine, a thrilling hybrid of old Italian habits and modern Australian know-how. Joe Grilli is one of South Australia's most talented winemakers, and he's of Italian descent. Here he uses an old north-east Italian method of drying the grapes before fermenting them. This reduces the volume, increases the sugar and density of flavour, but also adds a brilliant kind of sweet-sour uncertainty, which means every vintage of Moda ages quite differently to the one before - but they do all age, superbly. This is still earthy, with a grape-skin graininess and bitter black chocolate depth, with the fruit showing as dates, dried figs and prunes. For a thonking great mouthful, drink it now; but keep it for 10 years and it will emerge as one of Australia's greatest red wine experiences. New from one of Australia's winemaking greats - and as usual from Joe Grilli of Primo Estate, it overdelivers. It's only 11.5% alcohol but it bursts with fresh ripe flavours - apple blossom and blackcurrant leaf aromas, ripe apple flesh fruit and the gentle acid reminder of boiled lemons, all transformed into happy juice by a cascade of soft-edged foam. Here it is. The modern history of Australian red wine in a single bottle. There's Shiraz from every vintage since the 1980's, a random selection of early 1960s and 1970s Australian red wines, all piled in with a big barrel of Moda Cabernet-Merlot to make the mother of all base wines. It is then liquered with old Australian fortified wines - so much age, so much history, so many good and bad times, wines fatigued, wines supernaturally bright. This shouldn't fizz, it shouldn't foam; most of these flavours should be slumbering in the cobwebbed gloom of a forgotten cellar, tasting of leather aprons and smoke and the sweaty sparks of the blacksmith's forge. They shouldn't be in a fresh, young bottle and, dammit, they shouldn't foam, it's not respectful. This mixes old Burgundian decay, old toffee-prune Shiraz, the withered cream of old Grenache and Mataro, the distant memory of blackberry and blackcurrant when the wines were young and hopeful. All thrown together in this last-chance cauldron, this writing, foaming medley of old and very old, renewed to laughter and delight by the magic of bubbles.